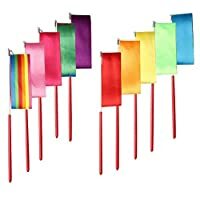 This item is a set of 12 pcs colored ribbons, which can be used for a variety of fun activities, such as decorative props, scene layout and party decorations. It's a hit for kids who like to twirl, dance and be active. They would have a lot of fun creating eye-catching swirls, loops and squiggles with these corlorful ribbons. The product is great for use in group physical education classes. 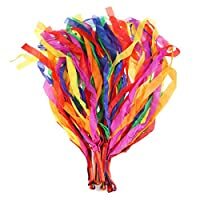 Occasions: Ribbons streamers can be used for movement and dancing exercises outdoor or indoor. Features:There is a layer of protective paint outside the dance ribbon，they do not hurt the hand. Size: Ribbon -Length 78.7 inches; Width 1.8 inches Handle -11.8 inches. 10Pieces, 10 colors (red-rose-orange-pink-dark green- light green- apricot- yellow-blue-purple). Especiality：2M color ribbon designed especially suitable for kids do any movements and dance . SIZE - The ribbon length 200cm/78.7"; Stick Length 30cm/11.8". ADVANTAGE - 2-meters ribbons are suitable for kids of 6 years old and above, not only developing children's intelligence but also enhancing their physical ability. APPLICATION - Widely used in gymnastics, training, recreational activities, circus skills, color guards and so on. Per set includes 12pcs.Each ribbon length: 100 cm/ 39.4". Perfect for juggling and other entertainment activities to develop chilren's hand-eye co-ordination, concentration and sense of creation. Great for music classes or gym class. These colorful ribbons are also can be used as party props,stage set or ball decoration. Size: Ribbon 157" * 1.97", Stick 19". Enough length for kids to hold up. Environmentally friendly materials, gradient color. Satin ribbon material, smooth, light and fade resistant. Anti-slip handle ensures better and safe operation. Ribbon 157" length and its bright color, very beautiful when twirling. Could be used for artistic gymnastics training and any school or company dance performance. Also can be used as kids gift, decoration of festival, wedding and parties. Various applications: These gymnastic dance ribbons are suitable for gymnastic, training, fun activities, artistic dance, etc. This multi-colored stunt streamer stretches to 4 feet in length, wands about 20cm (7.9inch)creating huge, fluid shapes when it moves. The brightly colored streamer resists tears and stains, and holds up under hours of intense play. Recommended for ages 5 years and up. Package includes 2 rhythmic gymnastics ribbons, one rainbow and one colored flame. 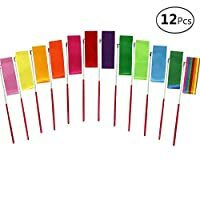 The rhythmic ribbon is ideal for baton twirling, gymnastic, training, circus skill, color guard, and marching band, etc. The rhythmic ribbon size is also suitable for kids of 3 years old and above. 4 Pieces, 2 colors (rainbow：2pcs & colored flame:2pcs). Perfect for keeping feet warm around the house! Starry sky color,6 pieces gymnastic ribbons are in rainbow colors which are softer than other ribbons.It's very beautiful and attractive to Children. Bright color and Anti-slip handle make kids energetic, enabling them to participate in different kinds of dance. 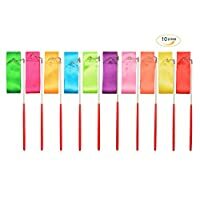 Dancing ribbons are suitable for baton twirling,artistic dancing,gymnastics ribbon, ,physical training,circus skill ,and other fun activities. Package contains 6 pcs dancing ribbons in Pink handle and black handle.